Weiter In a Vase on a Monday: I’m late!!! Wonderful colours…and very artistically posed. 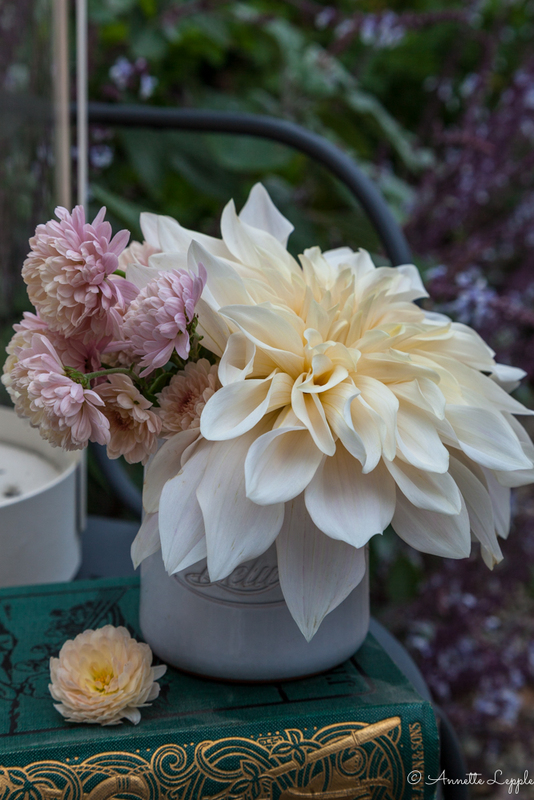 Love your vase of D. ‚Café au lait‘ and newly annointed Chrysanthemum ‚Café au lait‘! Such gentle, subtle colors and your staging creates serenity. Enjoy your raindrops and have a wonderful week Annette. They do work well together and I think you’ve chosen the perfect name for the Chrysanthemum! I’ll be looking for some new ones this week. thank you, Christina, I hope you find some nice ones – do you plant them out afterwards? Yes, if they are good plants I’ll take basal cuttings. Gorgeous blooms and I love the entire composition. 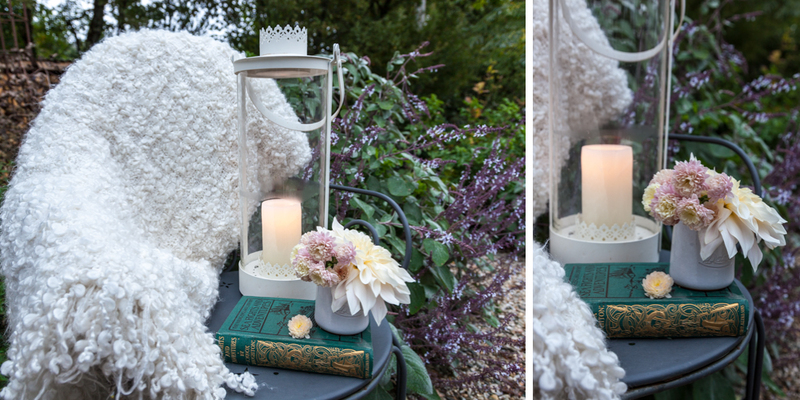 Café au lait, a good book, and a warm blanket are perfect for the chilly evenings of autumn! What a perfect combo….love the colors in that mum….really takes my breath away! Enjoy the rain. I love the chrysanthemum it is a gorgeous colour. Café au Lait is rather big and blowsy but what a fabulous colour and what a perfect match. It’s not very floriferous at all, Cathy, wouldn’t grow it again as the foliage isn’t pretty either but the chrysanthemum is a true winner. Lovely pairing and setting, Annette. As much as I admire CAL, it’s size holds me off from growing it. I’d love to see them hybridize a smaller version! I agree, Eliza, wouldn’t grow it again, the smaller flowers are prettier and often have nicer foliage. My fav remains David Howard. I’ll have to see if my supplier has that one. Always glad for a recommendation. Discovering just the right match for a favorite flower can be a source of joy in itself. I’ve yet to try ‚Cafe au Lait‘ but with my burgeoning dahlia fixation, I’m sure I’ll get to it. Wind rather than cold weather put an early end to my dahlias this year. I grew several of the „dinner-plate“ varieties but appreciated that the blooms got smaller as the season progressed, making their heavy heads easier to manage. A beautiful composition. My cafe au lait plant produced just one flower- and then the first came. Yours is quite beautiful. Gorgeous, Annette. I love the way you composed the setting too. wie schön, dass Du wieder da bist. Ich habe mich noch gar nicht gemeldet, aber fleißig mitgelesen. Die milchkaffeefarbene Dahlie ist außergewöhnlich, ich kenne diese Farbe gar nicht. Deine Farbkombination funktioniert sehr, sehr gut – sieht sehr edel aus! Hier dominieren mehr die kräftigen Farben, scheint mir. Ich habe meine Dahlien vor wenigen Tagen ausgegraben und lasse sie gerade noch etwas abtrocknen, bevor sie in den Keller wandern. Wir hatten vor einigen Tagen einen etwas strengeren Frost, der ihnen gar nicht bekommen ist. Regen hatten wir in Oberbayern auch, aber insgesamt jetzt auch nicht soooo sehr viel. Ich wünsche Dir einen schönen Novemberbeginn! Liebe Doris, bei mir dominieren sonst auch eher die kräftigen Farben, aber für den grauen Herbsttage passte die Dahlie gut. Hab sonst eigentlich keine Schwäche für die grossblütigen Dahlien. Frost gab’s zum Glück noch nicht – ich warte noch auf die Blüte von Dahlia imperialis. Zum Glück kann ich Dahlien hier im Boden lassen, sonst wäre ich wahrscheinlich zu faul und würde drauf verzichten ;). Schöne Herbsttage! ich habe deine Adresse verlegt. Und bei facebook finde ich dich auch nicht mehr. Schickst du mir bitte nochmal deine Kontaktdaten? Danke dir!